Nice to meet you, I'm TACHIKOMA. 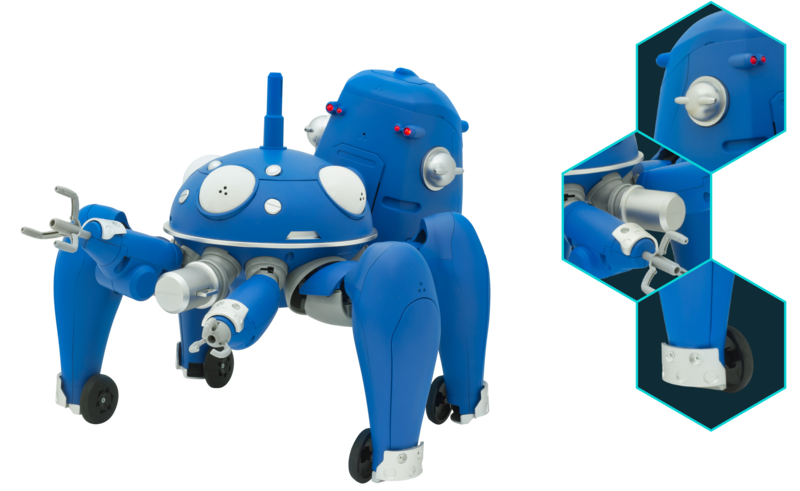 TACHIKOMA, a smart toy replica of the AI robotic weapons platform that appears in the animation "Ghost in the Shell", is fully movable and can move around by it’s own robotic feet and wheels. It is the first Ghost in the Shell product,(*) with the perspective of the world of "Ghost in the Shell S.A.C." that realizes electric movability of each joint, pod, manipulator, and wheel. It features a speech recognition function that allows users to communicate with TACHIKOMA in natural language, reproduces the "synchronization" ability between all other TACHIKOMA(s) and has a walking/running function controlled via smartphone. * For products that can be ordinarily purchased. Modelling of 1/8 TACHIKOMA was based on 3D data used in the animation production. Following the original shaping as much as possible and finished to a quality that seems like it has just jumped out of the world of ”Ghost in the Shell”. Editorial supervision by TV series director and other members. Editorial supervision of the TACHIKOMA unit and specifications overseen by Ghost in the Shell S.A.C. TV series director - Kenji Kamiyama. Also, the recorded vocal lines were supervised by Yoshiki Sakurai, the screenwriter and Kazuhiro Wakabayashi, the sound director of the TV series. Maximum "TACHIKOMA-likeness" was achieved with the assistance of the original "Ghost in the Shell S.A.C. team. New recordings of 600 authentic TACHIKOMA vocals with new lines and sounds (by original TV series V.O. actress Sakiko Tamagawa) You can enjoy new TACHIKOMA vocals which can be only heard from 1/8 TACHIKOMA, as well as lines from the original TV series. With the latest technologies such as speech recognition, natural language processing and voice synthesis, conversation with TACHIKOMA has been realized. In addition to new recorded vocals by Sakiko Tamagawa, voice synthesis using her voice is also supported, so you can enjoy infinite possibilities of conversation with TACHIKOMA. Each leg joint and wheel has a mounted motor, realizing a high degree of free range of motion. The two eyes can also move up and down and right and left via two motors. Motors power each hand and pod, making it possible for them to move independently. Dynamic actions like in the original animation can be reproduced. Moving in various ways, making full use of its free range of motion, TACHIKOMA expresses emotions with gestures according to what's being spoken and behaves with a life-like personality. 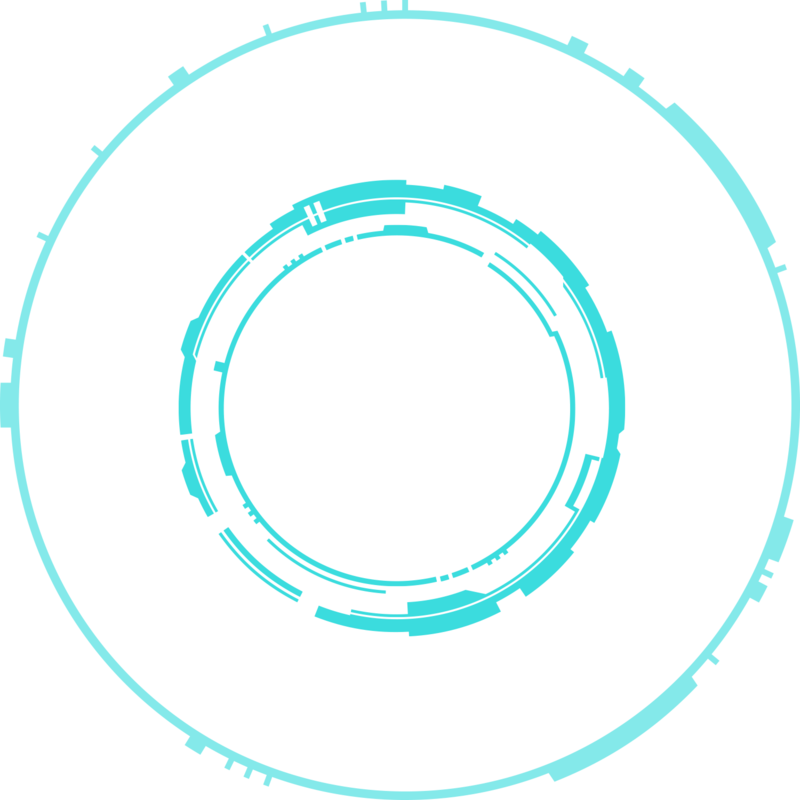 * The continuous maximum moving time of the motors, excluding the wheels, is up to 1 minute every 4 minutes. If it exceeds 1 minute, cooling mode will be enabled and the motor will stop motion for up to 3 minutes. A camera-based object recognition function is also installed. When you show an object to TACHIKOMA's camera, the cloud object recognition engine recognizes the object. For example, when you show an apple to TACHIKOMA and ask "What is this? ", it will recognize it and say "It's an apple." Then, if you tell TACHIKOMA "An apple is sweet", TACHIKOMA will understand this by using speech recognition technology and TACHIKOMA learns the information that "an apple is sweet". The more you teach information, the more TACHIKOMA learns. Synchronization, one of the main features of TACHIKOMA, has been faithfully reproduced. TACHIKOMA transmits the learned information to the cloud, and all other TACHIKOMA(s) then "synchronize" the information as new TACHIKOMA memories. Other TACHIKOMA who synchronize can then talk about an apple when they see it, saying "an apple is sweet" without having studied it directly. *The graphic is a sample image. Actual information is being synchronized on the server. TACHIKOMA walks like the way it does in the original TV series, with multi-legged, dynamic walking. In addition, it is also possible to move forwards, backwards and turn using the wheels. 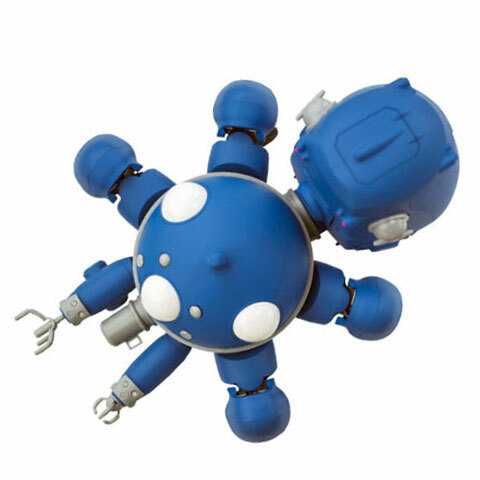 You can freely control TACHIKOMA, making it walk and run via the companion smartphone app. As in Ghost in the Shell, an internet connection is an indispensable tool. 1/8 TACHIKOMA also has an internet connection, making it possible to collect information from the internet. For example, ask TACHIKOMA for weather forecasts and trends, and if your Google Calendar is synced with TACHIKOMA, TACHIKOMA will tell you your schedule. TACHIKOMA can be fully operated via the companion smartphone application. 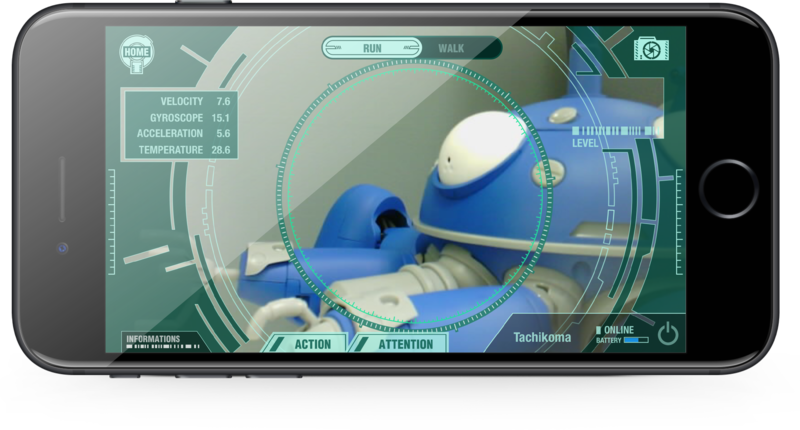 On the application screen, real-time video is captured by a camera mounted on TACHIKOMA and you can control TACHIKOMA to move or to take actions while watching the video on the screen. 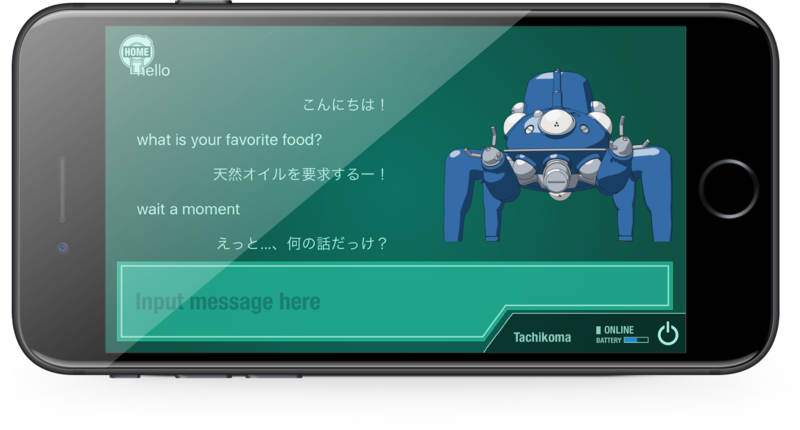 As well as conversation with TACHIKOMA itself, you can talk with TACHIKOMA on the smartphone application. Even if you are away from TACHIKOMA, you can enjoy conversation as if you were communicating directly with TACHIKOMA through cybercomms. 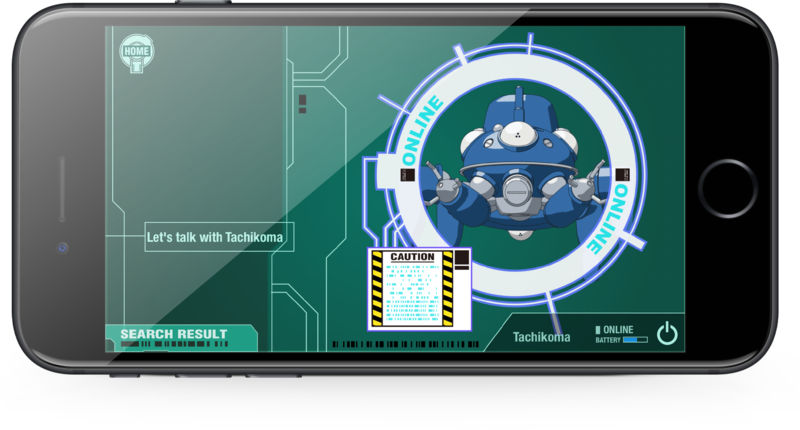 Information that TACHIKOMA searches for on the internet and images taken by TACHIKOMA will be saved in the information screen on the smartphone application. You can check the information after each search, or check it all later collectively. TACHIKOMA can be a very effective information assistant. In commemoration of the release of 1/8 TACHIKOMA, Cerevo offers in limited quantities a SPECIAL EDITION which uses crafted aluminum parts for the bumper part and barrel cover part of the main body. * Some parts are chrome plated. * 5GHz 11a/ac is available by using the USB Wi-Fi adapter sold separately. ●1/8 TACHIKOMA is a precision device. Do not drop, hit or subject it to strong shocks. Doing so may cause a malfunction or damage, resulting in unexpected accidents and injuries. ●Please use in a wide enough space that there are no obstacles in the surrounding area and it will not fall. ●Do not bend the moving parts by hand, whether powered on or off. ●Do not use sufaces such as shaggy carpet and soft or slippery flooring that may affect grip. ●Do not use in areas with slopes or gaps of more than 5mm. ●This device is not water proof or drip proof. Do not use near liquid.